Last week we announced the launch of Apple Pay. This week we have good news for Android fans and Chrome users. Donorbox donations can now be made using Google Pay! You can make donations using Google Pay from most devices, including your computer’s Chrome browser, Android phone and even on iOS devices with the Chrome app. Google recently announced that it would combine Google Wallet and Android Pay into a single brand called Google Pay. Google Pay will make it easier for you to use the payment information saved to your Google Account, letting you complete online payments quickly and securely. 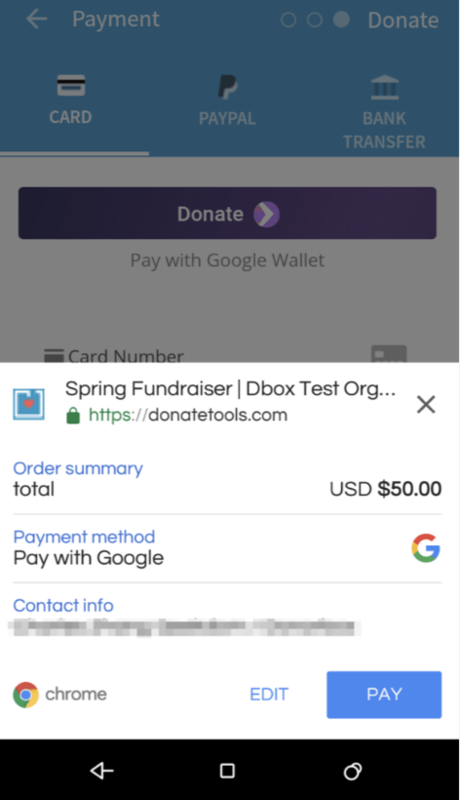 Google Pay donations can be made from any type of Donorbox integration, so you are good to go whether you’ve embedded the Donorbox form, used a pop-up, or used a link to the secure campaign page. 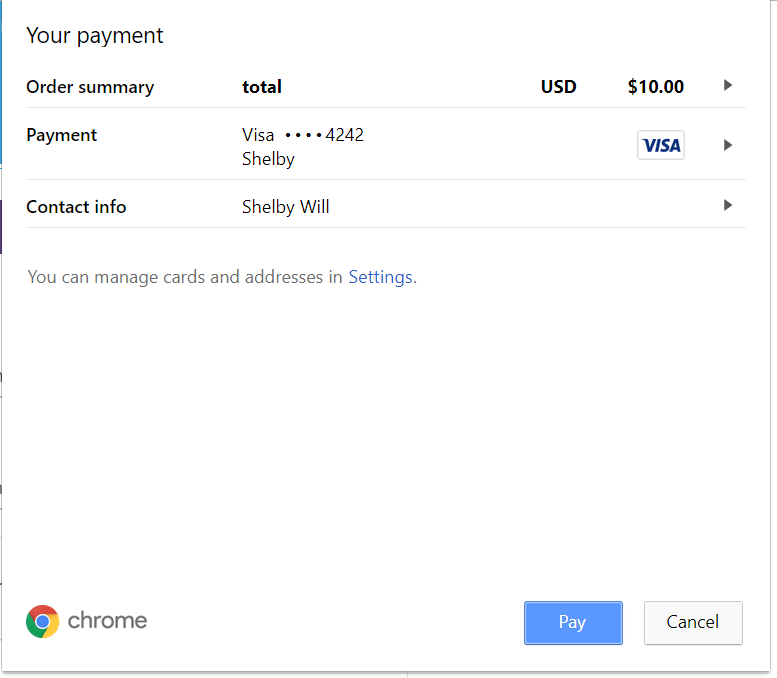 To use Google Pay with Donorbox, you will first need to add a payment method on Google Chrome. Click here and scroll down to “Add and edit credit cards” for complete instructions. 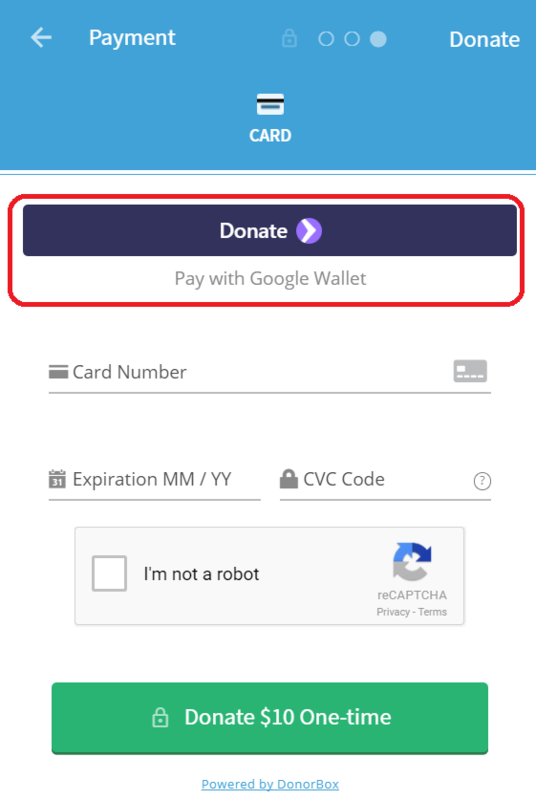 Once a credit card has been added, Google Pay will automatically appear on your donation form except in the case that you have installed a Donorbox pop-up or embedded form before January 18th. Donors will select the amount they wish to donate and enter their information as usual. Then, they will have the option of entering credit card information or using the purple Google Pay button. Once the purple Google Pay button is selected, a pop-up like the one below will appear if you are using Chrome on your computer. Here, the donor can select the credit card they wish to use and verify the donation amount. If you’re using an Android phone, your screen will look like the image below. Lastly, the pop-up form will require a CVC code for the credit card. This is the only information the donor will need to enter- everything else can be auto-filled with information saved in Google Chrome, making online donations more convenient than ever. Google Pay makes online donations more efficient than ever while allowing Donorbox to continue to uphold the highest level of security for online payments. We hope you are just as excited about this awesome new feature as we are.